is the right book if you are new to programming. ...ist das richtige Buch, wenn Du mit dem Programmieren erst anfängst. is the right book if you are no longer new to programming and want to know aything from just what to learn first up to nearly everything. ...ist das richtige Buch, wenn Du mit dem Programmieren nicht gerade erst anfängst und irgendetwas willst, sei es nur etwas um mit Perl anzufangen oder gleich fast alles, was es da gibt. ...is the most excellent book if you are no longer new to programming and want to learn object orientation and perl. ...ist das herausragende Buch, wenn Du mit dem Programmieren nicht gerade erst anfängst und Objektorientierung und Perl lernen willst. ...is the right book if you are looking for handy concise well-explained code sniplets on everyday programming problems. ...ist das richtige Buch, wenn Du praktische kurze gut-erklärte Programmierbeispiele zu häufig auftretenden Problemen suchst. 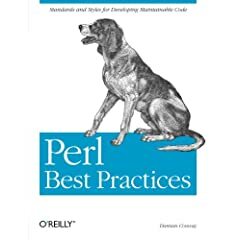 ...is the most excellent book for idiomatic programming in perl. ...ist das herausragende Buch, wenn Du erprobte Perl-Idiome zum täglichen Programmieren benötigst. Prices differ considerably among these competitors!